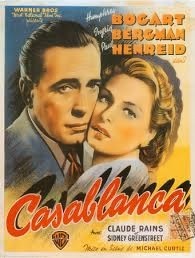 Review: Rick Blaine is an American emigrant in Casablanca. His long lost love appears in the town with her husband. This causes problems and complications for everyone involved. Amazing film!! This is one of America’s best films. This was well directed and well cast. In 1944 at the Academy Awards it won 3 Oscars. They were for Best Picture, Best Director and for Best Writing, Screenplay. They had to build Rick’s Cafe on set. The film went over budget by about $100,000 and cost $950,000 to make. When they came up with this film it was originally going to be called “Everybody Comes To Rick’s”. In December 2012 at an auction they sold Sam’s piano for more than £370.000. I have just been reading Mark Kermodes’ book, Hatchet Job. In the chapter called Ask The Audience he goes on to talk about Casablanca. He gives a few questions at the end of a paragraph. One of them made me think and it was “Would you have opted for honour over heartbreak?”. This is on Barry Norman’s list of 100 Greatest Films of all time that he produced at the start of 2012. One film critic wrote “One of those rare films where every shot and every quotable line of dialogue counts, there’s not a dead patch in Casablanca”.